Helping students to realize that they need to understand and accept their “type” as an actor is one of the most difficult things I work on as an acting and vocal coach. It is also one of my most favorite challenges to conquer. So often, as pe rformers, we have a hard time knowing how others see us. We want to play the sweet Ingénue or Leading Man when we would be better suited to play the hilarious side kick. What we forget, is that accepting and celebrating the type for which we are best suited will allow us to stand out as total rockstars and hit success that might never be possible if we went against our type. If you are brave enough to follow these steps you'll find a new sense of freedom knowing you have a more focused plan as an actor who knows their “actor type.” Next week, I'll discuss how to use your actor type to book work! First, since this is a “Terminology Tuesday” post. Let's define Actor Type. The characteristics that others most easily connect to an actor upon first impression. This is less about the layers of who you are as an actual person and more about how you are perceived. Actors like to fight this and say, but I'm so much more than my type! You can explore the depth of your talents in a class, and once you have established yourself with a company or a director… but it is important to make it easy for casting directors that you've yet to work with. Most audition postings have breakdowns that explain the “type” they are looking for and it's smart to know where you fit, and sell the heck out of it. In literary terms you can think of an actor type as a stock character. Here's a lengthy list via wikipedia. 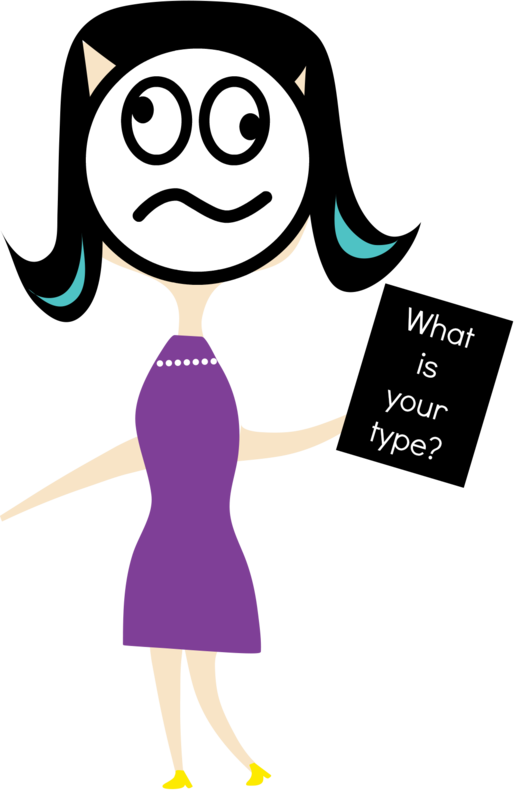 It's difficult to define your type without knowing what possibilities are out there. Think of all of the shows you've seen and start to notice how you would describe the characters in just a few words. If you've not seen many shows in the theatre, hop to it!!! There are many shows available online for little to no cost – or take Jes DeGroot's advice in her most recent post and go to the library. As an actor it's your job to be as informed as possible. What is my vocal type? If you are unsure about how to answer this question a great place to start is in this post about finding your vocal range. But remember, your voice type is about so much more than how high or low you can sing. Are you a big brassy belter like Sutton Foster? Do you have a high pitched nasally soprano voice like Kristin Chenoweth? Is your singing voice more about the choices you make as an actor than the beautiful music you are creating like Josh Gad? Are you more of a pop singer/rapper like Lin-Manuel Miranda? Ok, so here's the hardest part of this whole “Actor Type” thing. Once you figure out your type, STOP FIGHTING IT! Accept your actor type and CELEBRATE IT! If Josh Gad thought he was a leading man and only went in for those roles, he would NOT be cast. And, then we'd not have his goofy voice charming the pants off of children all over the world as Olaf in Disney's Frozen. Here's my current example. I really, really, REALLY love the show In the Heights. The Chance Theatre is holding auditions for their production of the show in early April. I can try and pretend that I am right for it because I have dark hair and I'm married to John Dominguez… but, I don't speak spanish, nor have I spent any time working on a spanish accent, and The Chance Theater is located in Southern California where there are clearly several other hispanic actors who would be better for the show type wise. If I wasn't super pregnant, I might go to the audition for fun or for the off chance that they are looking for an Irish/Italian type. However, I'd be better off auditioning for a show that I'm the right type for than having my heart set on a role that isn't really for me. I recently found this video of Brian O’Neil, an NYC business coach for actors with advice on finding your type and I LOVE it! As always – I'm here to help. So, if you'd like to send me your headshot and resume, I'd love to help you to find your actor type : ) And… look for next weeks post about using your newfound type to book work! Hi love your post, it has been very helpful. I need help with finding my type could I send you my headshot? Sure Devon! Send it to thepreparedperformer@gmail.com I’d love to help. I’m glad you found this post helpful! Hi, Molly. I also need some help to find my type(s). I was scheduled to get headshots last Thursday, but decided to postpone it and do a big research about types, and after play the “what if”, and then create some log lines that might help me to keep up the “character on” while shooting! Would you help me with the type thinking process? Sure! Where do you feel stuck? In just knowing your type in general? If that’s the case, send me your most recent headshot, resume and any demo videos. I’ll give you my thoughts! Molly@ThePreparedPerformer.com : ) Congrats! I love your ideas! Do you still help people find their types, if so can you help me? Awesome post Molly, thanks for taking the time to write this article. It was for very helpful, clear, and concise. You are most welcome! : ) Glad it was helpful! Thank you so much for this! Very helpful! … however I’m still just a little bit confused. So am I meant to pick literally one Role Type or can I use a few? E.g. I just don’t know!!! I can’t pick between them! I’m working on determining my “type” to be able to target specific roles. Please help.